If there is one thing clear from the Class of Love workshop held at Supermarkt, Berlin on April 14, it is that Berlin is an international collection of artists and thinkers. In a class of approx.. 25, the diversity of age and cultural concepts was apparent from the start. Over 80% of the class came from the arts, and the other 20% from the sciences. With 9 different countries represented, including Germany, USA, Canada, Brazil, Israel, Spain, Korea, Japan and Australia, and ages ranging from 20-60 yrs. old, discussion often reflected strongly felt opposing differences. The first part of the workshop entailed personal reflections on love as an intellectual idea and a feeling, a memory of love. As part of the process, we looked at our media choices and the experience of media as an intermediary to emotional expression. What narratives of love does the class relate to? Where is the class connected in ideas and expression and what separated us? The class filled out the form and experienced saying “I Love You” to the camera as a starting ground for deconstructing love. The results of the form were broken down into each specific area. Starting with ‘What is Love?’ How do you define love? According to the majority; Love is caring, attraction and affection. A few people pointed to self-love & acceptance, love as investment, love as an attitude and a biological fact, with one person suggesting it can be whatever you want it to be. Memories of love where less varied with over 2/3 remembering family moments. Romantic moments ran second, followed by friendship and one person related to a personal moment in time rather than love involving another. When it came to what was not love, the class went their separate ways with over 17 differencing opinions ranging from Hate, Anger, Violence, Fear, Guilt, Terror to Egotism, Attachment, Dehumanization, Obsession, Possession, and finally Discontentment, Apathy, Absence, Living counter intuitively and Settling in love. Biology was pointed to as both love and not love. As the class came from different worlds often media reflected culture with several people listing linguistic favourites over mainstream media. The majority of media choices still come from Hollywood, with romantic stories of love trumping all. Love stories of lost love or self-love in the face of loss, came second with only a few relating to stories of family love. 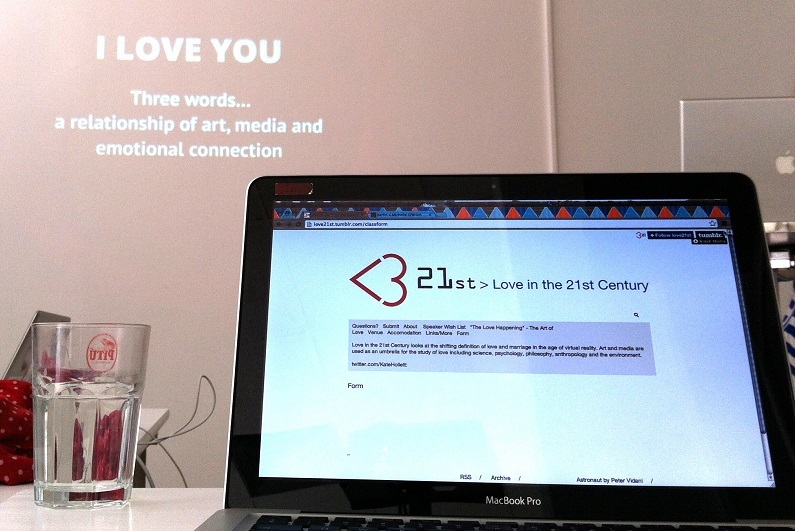 When asked to upload an image that represented love to the class, the images showed a striking disconnect from thoughts and words. Over 50% of the class uploaded an image that was an object or objectified extension of love. For example, one photo was a meal on a bed. For the person who uploaded this, they told a story of connecting to their mother far away by sharing her dinner with her. Many used images of personal art or art that expressed a complex idea of love. Many images held private narratives only understood through explanation. Nature came second to personal object imagery. One person used an image that reflected loss and one person chose a image of family. Discussion was lively and passionate with a clear line between women and men in the class. Often people would start talking in their mother tongue when frustrated; 2 German men and two Spanish women commented to each other when opposing voices became too loud. Images provided access to further insights through story telling. Some approached the topic intellectually and others spoke emotionally. The differences in attitude escalated the emotional output. As an observer, it was fascinating to watch the process as people’s expressions and bodies during the experiments. Everyone was partnered with a stranger and asked to look into their partner’s eyes for a few minutes. The tension was thick when the one-minute mark was announced. Many people changed facial and body expressions starting with a polite smile to often to a drop in posture, sadness, and/or letting go, and then to one of welcoming warmth. It was very difficult to stop the experiment as the newly formed connections opened up conversation. Many people talked about the change and experience as both hard and moving at the same time. One notable experience came when one woman realized what her blocks were in love when faced with shared intimacy in the experiment. With little time to cover the science, sociology, philosophy of love, knowledge bases were condensed into brief summaries so that conversations could be continued. Media was covered as a form of communication and connection, looking at the ways digital technology was changing our emotional expression. The class went overtime and many mentioned being leery of a 4 hr. commitment only to feel that they wanted more, wishing it was a full day. For me as an Interdisciplinary artist, it was social art adding to the social sculpture that is the “I Love You’ project; a continuously morphing connection of the experience of love with each definition and expression adding to the meaning of love. The process is educational adding to the research of the School of Thinking and Feeling (tsotf.com) and creating a form of emotional education. Can love be learned? Love is a collection of ideas and feelings that crosses boundaries of family, nationality, religion, identity, at the same time, love creates it’s own boundaries based on survival. If Berlin is a city full of artists and thinkers, then the message that is uniquely Berlin is the visual depth of meaning in imagery. Ideas are manifestations of story-tellers rather than empathetic audience members. Want to be part of the process? Take the quiz; fill out the form. Add an image of love, tell share your favourite love stories/movies/songs here. What is love? Add your voice. « Gemeinschaftlich gestalten statt konsumieren!